For organisations who are looking to minimise application downtime but are limited on IT team resources and/or budgets, Starwind offer the StarWind HyperConverged Appliance (HCA). StarWind HCA is a 100% software-defined hyperconverged platform built with Dell® OEM or StarWind-branded server platform. There’s a lot they offload from customer’s shoulders: picking the right hardware and software, migrating the applications, and integrating the HCA in your datacenter. Their engineering team does it all for you at no extra cost! It's also the only solution on the market that offers true HA with just a single onsite node. The days when you had to chase support when something breaks are gone: HCA ProActive Support monitors the cluster 24/7, predicts failures and reacts to them before things go South. Thereby minimising downtime and management efforts even further. Provides your business with an unprecedented level of services availability and data security by preventing failures proactively instead of dealing with consequences. In the case of a problem, StarWind engineer gets an alert and reaches out to you to resolve it, saving your valuable time and efforts. Provides organizations with constant applications uptime and uninterrupted business continuity. The Stretched Clustering support allows avoiding the production downtime due to Live Migration between the geographical locations. Moreover, the IT infrastructure resources are utilized by 100% thanks to active-active shared storage replication. SMB3, an evolved version of SMB (Server Message Block) protocol, provides file-based access to applications data. Being designed to max out hardware utilization efficiency, StarWind implementation of SMB3 decreases CAPEX and simplifies Scale-Out File servers deployment. NFS (Network File System) is a distributed system protocol providing users with the remote access to data over a shared network just if it was kept locally. StarWind implementation of NFS eliminates the need for dedicated shared storage, so CAPEX and OPEX become significantly lower. Also, it merges the storage and compute layers allowing the cluster to go well with only two nodes. SMI-S (Storage Management Initiative Specification) provides a simple and unified way to orchestrate the entire storage infrastructure. StarWind SMI-S provider, in its turn, delivers system and storage administrators the single “pane of glass” management over SCVMM and OpenStack. Thanks to SMI-S support, most operations can be performed from console and automated. StarWind Web-based Management provides system administrators with the ability to access and manage their StarWind infrastructure via HTML5 web console from any remote location. This functionality delivers the full control over the storage-related operations from a PC or Android, iOS or Windows mobile device. StarWind HyperConverged Appliance includes space reduction technologies for increased performance and capacity utilization. Deduplication and compression reduce the actual amount of data to be transferred, written, read or processed, therefore removing the unnecessary workload from HDD, flash and interconnect. StarWind HyperConverged Appliance scales according to business needs, allowing both scale-out and scale-up architectures. 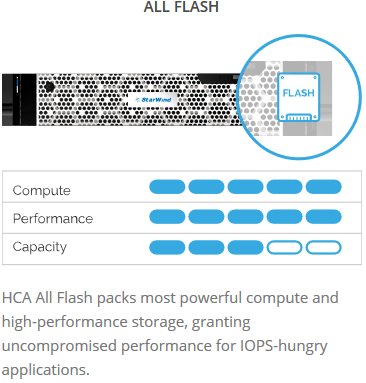 Ready HCA nodes or individual flash and disks can be added to handle the growing workload without “overkill” over-provisioning and over-spend. StarWind HCA is versatile due to the help of multiprotocol StarWind Virtual SAN. It deploys industry-standard protocols allowing users to create virtually any architecture. StarWind HCA supports: SMB3, including SMB Direct and SMB Multichannel, NFS and iSCSI, VVols, NVMf and iSER. Initially designed to create virtualization infrastructure from the ground-up, StarWind HCA can still become a part of existing architecture. The integration of VMware VVols support in StarWind products makes vSphere storage management highly efficient, simple and automated. StarWind VVols allows providing VMs with fine-tuned storage policies based on pre-defined storage configurations with required performance and resiliency characteristics. StarWind HyperConverged Appliance achieves fault-tolerance and high availability with a minimalistic two-node setup. It utilizes StarWind Virtual SAN, MS S2D or VMware vSAN to “mirror” storage and caches between the nodes. As a result, the appliance can withstand failures of individual disks, memory modules or even an entire node without compromising uptime. 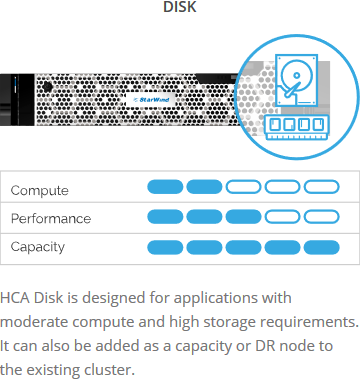 StarWind HCA adopts a hyperconverged architecture, combining compute and storage resources into one scalable layer. It is easy to manage and extremely cost-efficient, reducing all virtualization expenses, including energy consumption. For these reasons, Hyper-convergence is suited for organizations with limited budgets and understaffed IT teams. StarWind HyperConverged Appliance is, obviously, hyperconverged. However, it can integrate with with an existing “compute and storage separated” architecture, serving storage outside the appliance. It uses industry-standard uplink protocols: SMB3, NFS, iSCSI, NVMe over Fabrics, iSER, and SMB Direct. 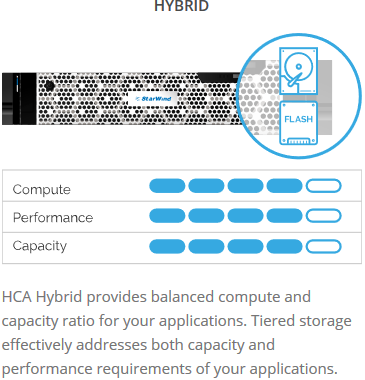 StarWind HCA utilizes multi-tiered RAM and flash caching for exceptional performance, reducing I/O latency to an absolute minimum. Utilizing StarWind VSAN, it achieves high performance with conventional SATA SSD, RAM and MLC flash. Cache is distributed between the nodes, achieving fast and reliable write-back policy without employing costly proprietary hardware. StarWind HyperConverged Appliance takes advantage of commercial off-the-shelf hardware enabling unrivaled cost-efficiency. By avoiding the necessity for proprietary hardware, end-to-end solutions can be architected for much lower cost. StarWind HyperConverged Appliance is pre-integrated with an industry-leading backup solution – Veeam Backup and Replication. It will ensure the safety of mission-critical data and minimize the risk of data corruption even in case of disasters without impacting performance and data integrity. Optional public cloud integration for disaster recovery can be provided. StarWind Automated Storage Tiering eliminates the need in manual intervention when assigning storage to applications since the data flow between tiers is fully automated. Moreover, companies don’t have to go all-flash as Automated Storage Tiering effectively matches workload-intensive applications with a high performing storage, so that no overprovisioning occurs. Virtual Tape Library (VTL) is an optional included feature that eliminates the need for physical tape by retaining all data on inexpensive, fast and high-capacity drives. In StarWind HCA, it is available in a software-only form as part of StarWind VSAN functionality. StarWind HyperConverged Appliance employs StarWind VSAN Log-structuring feature to handle virtualization workload. It battles issues causing performance degradation such as “I/O blender” scenarios. As a result, log-structuring makes the minimalistic resources sufficient for even enterprise routines in addition to everyday tasks. StarWind iSER completely eliminates the problem of network bottleneck by supplying higher bandwidth for block storage transfers. Further, it ensures the highest performance in the clustered systems by avoiding latency issues. Therefore, with StarWind iSER, VM migration, data and VM replication become faster and easier to perform.